This year’s edition of the NIKE WE RUN MANILA 10k will take us not Southward (last year was at the MOA) but somewhere North, specifically in MARIKINA . When I first heard about this new venue, I was pretty amazed with how daring, how gutsy the choice was as this has never been used as a race venue and bet you, only RunRio would have thought of this. Race kit collection has started today, November 27 and will be until Friday, November 30, from 10am to 10pm at Bonifacio High Street. *Late comers who arrive at the starting line after 5:45 am will not be allowed to race. PHILIPPINES, 26 November 2012 – On Sunday, 2 December, close to 13,000 runners will be up bright and early to take part in the Nike We Run MNL 10K race. It will flag off at the SM Mall of Asia activity area, at the corner of Seaside Boulevard and Bayshore Avenue. The runners will be part of Nike’s global We Run race movement which will see a total of 395,000 runners from 32 cities participating, forging a new global community of runners through Nike’s most connected race series yet with innovative Nike+ technology. Nike’s We Run MNL 10K race will bring the streets of Pasay City to life with 13,000 high energy runners expected to make tracks all over the SM Mall of Asia’s grounds. Set against the remarkable view of Manila Bay, the race will see runners pass through the commercialized area of the Mall of Asia with the SMX Convention Center and the latest icon of the area, the eye-shaped SM Bay City Arena. Runners are set to leave the urban commercial scenery and head towards the fields along Diosdado Macapagal Boulevard, before taking a turn on Pacific Avenue to race back to the finish line. At the finish line, runners can look forward to completing their Nike experience at the race village located at Seaside Boulevard, connecting with fellow running enthusiasts and athletes to celebrate their running achievements. Runners can also recharge and relax at the massage booth, as well as enjoy the refreshments from the juice bar. There will be a concert, hosted by Nike influencers Drew Arellano and Mia Bayuga, featuring bands such as Chicosci, Never The Strangers and Spongecola to keep the adrenaline pumping after the run. All finishers will receive a Finisher’s T-Shirt to commemorate the event and their running experience. 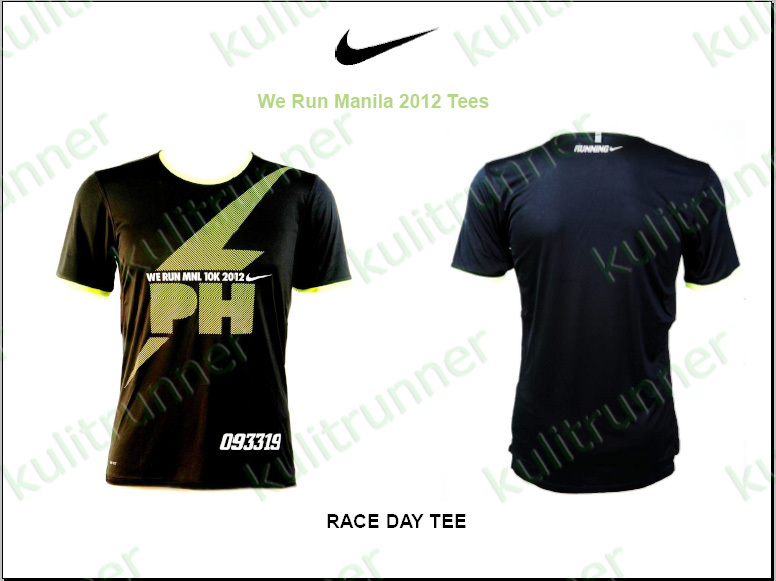 Adapting the global We Run design, and customized for the Philippines, runners are identified globally with the black Nike Dri-Fit race tee featuring a distinct volt green collar piping and a striking graphic in volt green. Runners who complete the run will also receive a finisher’s tee to proudly wear their achievement. In line with this, the race kit collection will be on November 27 to 30 from 10 am until 10 pm at the Bonifacio High Street activity grounds in front of Nike Park Fort, Bonifacio Global City, Taguig. Runners are reminded to bring their IDs and a printed copy of their confirmation slip to collect their race packs. The Nike We Run race series is Nike’s most connected race series yet with innovative Nike+ technology. The race series kicked off on September 1 in Prague Czech Republic, and will conclude on December 15 in Rio de Janeiro, Brazil. For more information, visit: http://www.facebook.com/NikeRunningPH or follow us on twitter via @NikePH. 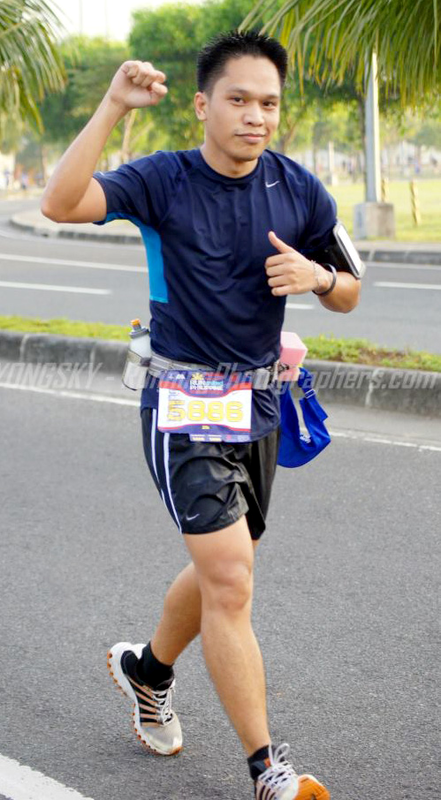 NIKE We Run Manila 10k Blog Promo Winners! 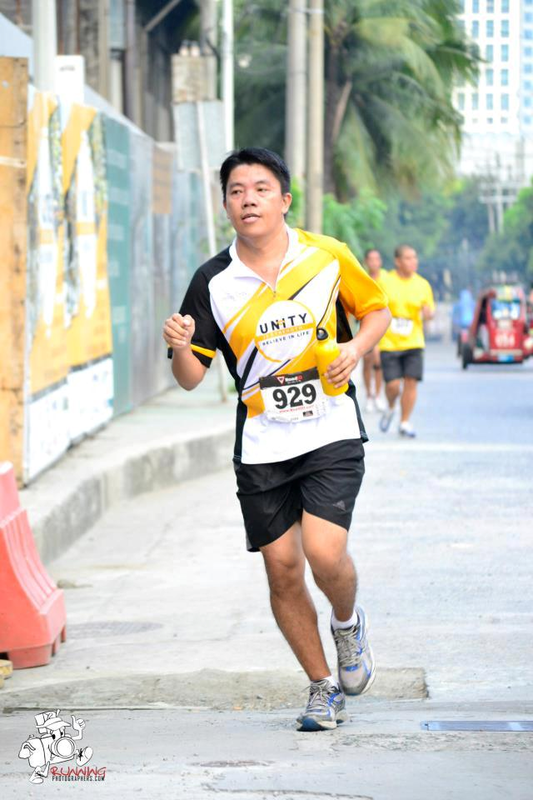 “My favorite sports heroes inspire me to run. I won’t forget that day when Philippines’ very own Lydia de Vega won the 100m dash in 1991 Southeast Asian Games. I was there at the jampacked Rizal Memorial Football Stadium, watching in awe as Diay crosses the finish line first, and dreaming that someday I might be able to experience the glory of being cheered on by my countrymen. I love running ever since I was little, but that dream will remain a dream. Realistically, I don’t run as fast as Lydia so I just studied and had a job. 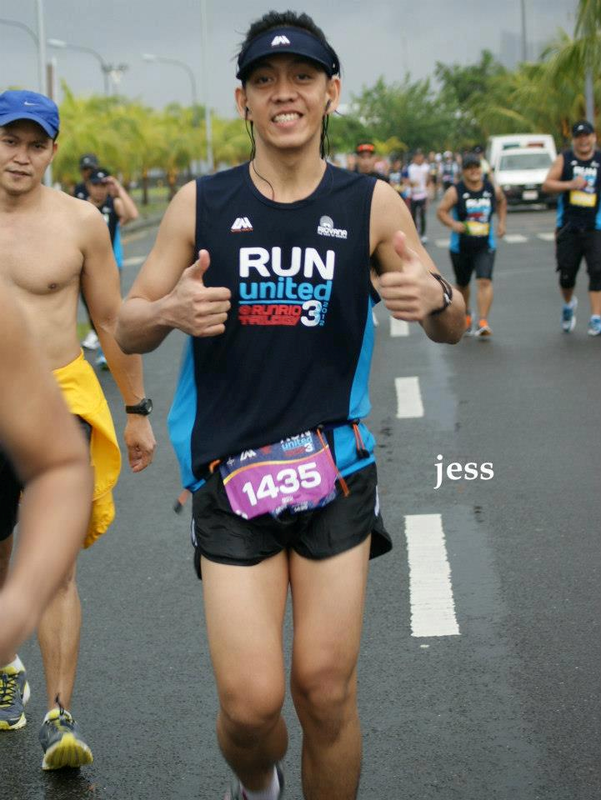 But whenever I finishes a fun run, I am feeling the same way as my idol did. Seeing all those people cheering at the finish line and all those cameras flashing everywhere makes me feel proud and victorious. “I always loved running…it was something I could do by myself, and under own strength. I could go in any direction, fast or slow as you wanted, fighting the wind if you felt like it, seeking out new sights just on the strength of your feet and the courage of your stamina.” For me running is a way to learn about challeges, accomplishments, struggles and a way to meet new friends and places. Again, congratulations to the three of you! Please expect an email from me with the details on how you are to claim your prize. Once you receive the email, you will need to reply outright for you to be able to claim/register for your prize. Hello All! The announcement of the three winners for the Nike We Run Manila 10k Race Kit Give-Away Promo is delayed because the judges are taking time to carefully choose the deserving entries as the winners. I apologize for this delay and be assured that winners will be posted here as soon as I have the list. 1. Share a link to a photo of yourself running. 2. Together with the link to your photo, post your answer (more than a one-liner but a max of 250-words) to the question: What inspires you to run? 3. Post your answer plus the link to your photo as a comment to this blog post. 4. Posting of entries will be until Sunday, November 11 at 11:59PM. 5. The three (3) best photos and answers will be declared as the winners. Each winner will receive 1 Nike We Run Manila 10k race slot and 1 VIP Lounge Pass. 6. Announcement of winners will be via Facebook.com/NikeRunningPH and @NikePH and will also be announced on this blog on Monday, November 12, 2012. 7. During the same week, a representative from Ogilvy Public Relations will get in touch with these winners to help facilitate the race registration and race kit claiming process. Important: Please bring your ID and confirmation slip to collect your race pack. NIKE We Run Manila 10k Registration EXTENDED! Nike We Run Manila again takes over the roads of Manila with its 10 KM run! With over 359,500 runners around the globe, We Run Manila participates in this multi-city running movement happening on December 2, 2012 at the SM MOA Grounds. Registration extension was announced for both online (until November 25) and in-store (until November 15) at the same time that NIKE release its official photos of the NIKE We Run Manila 10k Race Day and Finisher’s Tees! These shirts will be among the original Nike merchandise that runners will be entitled to upon registration (race day tee) and completion (finisher’s tee) of the race. 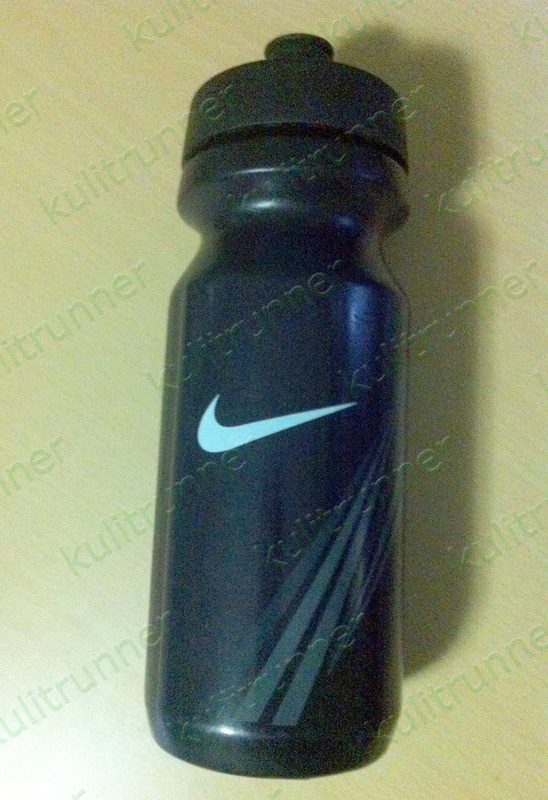 Another item that will be received upon race pack claiming is the Nike water bottle. Read below the official Press Release for this year’s edition of the NIKE We Run Manila 10k race! PHILIPPINES, OCTOBER 2012 – Nike’s We Run race returns to Manila for a second year, to inspire, motivate and connect runners around the world on December 2, 2012. The Nike We Run race series this year will be across 34 cities with an expected participation of 395,500 runners globally. In Southeast Asia, runners in Malaysia and Singapore have conquered their cities on 14 October and 22 October respectively. The We Run torch will be passed to the Philippines from Guadalajara, before making its next stop in Buenos Aires. 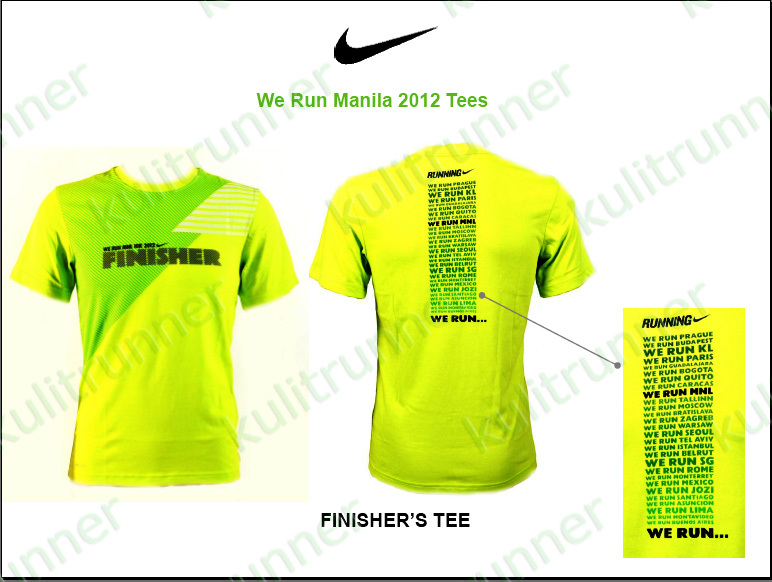 Participants of this year’s We Run MNL 10K can also look forward to receiving a We Run race tee. Adapting the global We Run design, and customized for the Philippines, runners are identified globally with the black Nike Dri-Fit race tee with a distinct volt green piping on the collar and a striking graphic in volt green. Runners who complete the run will also receive a finisher’s tee to proudly wear their achievement . In-store registration has been extended until November 15, while online registration is until November 25. Nike’s We Run Manila 10K race will energize the streets of Pasay City with the 13,000 high-octane runners expected to make tracks all over the SM Mall of Asia’s grounds. Set against the remarkable view of Manila Bay, the initial stretch of the race will let runners pass through the commercialized area of the Mall of Asia with the SMX Convention Center and the latest icon of the area, the eye-shaped SM Bay City Arena. Runners are set to leave urban commercial scenery and head towards the fields along Diosdado Macapagal Boulevard. Closing in on the halfway point of the race, runners will then pass the upcoming Belle Casino, a gold complex glistening in the morning sun. As they take a turn on Pacific Avenue and race past the same landmarks, runners will come upon the iconic ferris-wheel along Seaside Boulevard that marks the final kilometer to the finish line. The panoramic run would not be complete without an engaging en route entertainment featuring some of Manila’s top musical acts. Runners can expect to relax and recharge from their run with the array of services such as massage booths at the race village. This year, Nike is taking inspiration to a new level as runners will be able to follow one of Philippines most popular lifestyle bloggers, Lissa Kahayon of lissakahayon.com, who will be embarking on her first We Run race. Follow her We Run journey as she takes on the challenge of preparing for Nike’s We Run MNL 10K race, blogging at each step of the journey, and witness how Nike elevates her everyday running experience with the various product offerings including the Nike+ ecosystem. To get race-ready, Nike will organize training sessions focusing on proper running techniques and tips. Runners will also be able to test out the Nike+ Running app (available on iOS and Android), and try out the season’s latest running products. http://nikeinc.com/nike-running/news/nikes-we-run-race-series-connect-runners-around-the-world-through-nike or follow us on twitter via @NikePH.